"Where You Are" "If You Say My Eyes Are Beautiful"
(1987) "Where Do Broken Hearts Go"
(1988) "Love Will Save the Day"
Initially, Houston did not want to record the song, feeling there was no special message to convey. In a 2000 interview, Houston reminisced that she "hated the song". However, Davis believed the song would go to number one if she recorded it, so she agreed. It indeed became a number one, Houston's seventh consecutive number-one single in the United States -- a record for consecutive number-one singles that still stands to this day. Houston remained perplexed by the song and its lyrics. Wildhorn later recalled that Houston sent him a letter essentially asking: "Where do broken hearts go? I want to know." AllMusic's Ron Wynn highlighted this track. Robert Hilburn of the Los Angeles Times described this song as a ballad "that raises questions without making you care about the answers." 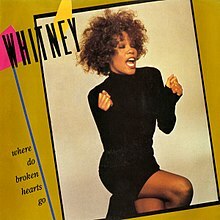 "Where Do Broken Hearts Go", released off Whitney as the fourth single in February 1988, debuted at number 47 on the Billboard Hot 100 Singles chart in the issue dated February 27, 1988. Within four weeks of its release the single reached the top ten on the chart, and finally peaked at number one in the issue dated April 23, 1988 after nine weeks on the chart, making Houston the only artist in pop history with seven consecutive number-one hits. In addition, she became the first female artist to achieve four number-one singles from one album, Whitney. To date, only four other albums by women have yielded four Hot 100 number-one hits; Paula Abdul's Forever Your Girl in 1988, Janet Jackson's Rhythm Nation 1814 in 1989, Mariah Carey's self-titled debut in 1990 and Katy Perry's Teenage Dream in 2010. Houston also had the most number-one hits (7) by a female artist in the 1980s, a feat equaled only by Madonna. The song topped the chart for two weeks, and spent 18 weeks on the chart. It entered the Billboard R&B/Hip-Hop Songs chart (formerly "Hot Black Singles") at number 60, the issue date of March 5, 1988 and nine weeks later reached a peak of number two (behind "Nite and Day" by Al B. Sure! ), becoming Houston's ninth R&B top five hit. On the Billboard Hot Adult Contemporary chart, the single peaked at number one, the issue dated April 2, 1988, and remained there for three weeks, making it her sixth No. 1 single on the chart. It was ranked number 33 and 47, on the Billboard Top Pop and Top Black Singles year-end charts for 1988, respectively. The single also placed at number two on the Top Adult Contemporary Singles year-end chart of the same year. In Canada, the song entered RPM Top 100 Singles chart at number 76, the issue date of March 5, 1988, and peaked at number six on the chart on May 14, 1988, becoming Houston's eighth top ten hit in the country. Worldwide, "Where Do Broken Hearts Go" was not as commercially successful as her previous singles from the album Whitney. The single debuted at number 30 on the UK Singles Chart, the week ending date of March 12, 1988, and three weeks later reached a peak of number 14 on the chart. In Ireland, it peaked at number two, the highest chart position of the song outside the United States. The song also reached number 48 in Australia, number 24 in Italy, number 47 in the Netherlands, and number 23 in New Zealand. The song was very popular in the Philippines, and it became one of the main focus of the 2014 indie romantic film That Thing Called Tadhana. The music video (directed by Peter Israelson) features Houston breaking up with a boyfriend and reflecting on happy memories; asking herself the title question, "where do broken hearts go?" At the conclusion of the music video, the couple reunites. Houston is depicted in various "glamour girl" shots throughout the video; Arista executives reportedly joked at the time, "there's her screen test", referring to rumors about Houston's Hollywood ambitions. In 2002, Israelson told Liquid Assets, a British TV documentary series focused on the net worth of celebrities, that Houston's performance in the video's 1940s-themed train station scene (filmed at Newark Penn Station) convinced Kevin Costner of her acting abilities for The Bodyguard. The video was moderately controversial since the ambiguous ethnic background of Houston's love interest (reportedly Houston's then real-life love interest, New York restaurateur Brad Johnson) highlighted the racial sensitivities that accompanied Houston's success during the 1980s. The singer had been criticized for "selling out" and "acting white". A mostly-black audience jeered when "Where Do Broken Hearts Go" was nominated for an award at the 1989 Soul Train Music Awards. Houston first performed "Where Do Broken Hearts Go" at Montreux Golden Rose Rock Festival on May 15, 1987. The performance was broadcast later in the US, as well as on various European TV channels. Houston sang the song at The 15th American Music Awards, held on January 25, 1988. She lip-synced to the album version of the song on the UK BBC1 TV show Wogan, which was hosted by Terry Wogan in 1988. "Where Do Broken Hearts Go" was one of the Houston's set list during Nelson Mandela 70th Birthday Celebration concert, televised live worldwide via BBC, at Wembley Stadium in London on June 11, 1988. In the US, the edit version of the concert was broadcast later on Fox TV network. Aside from the several live televised performances, the song was included on the set-lists on Houston's four tours, usually serving as part of a love song medley alongwith her other ballad hits. During her Moment of Truth World Tour (1987-88), the performance of the song was a little different to the album version. She started the song to usual tempo and was completed the song in an extended coda vamp, used her chest voice and falsetto appropriately. On her Feels So Right Japan Tour in 1990 and I'm Your Baby Tonight World Tour in 1991, Houston performed the song as the final part of a love song medley with "All at Once," "Didn't We Almost Have It All" and "A House Is Not a Home." She sang the additional lyrics such as "take me in your arms" and "say that you love me" extemporaneously at the end of the song. During I'm Your Baby Tonight World Tour, Houston performed the love song medley with the song at Welcome Home Heroes with Whitney Houston concert, dedicated to the US troops, their families in honor of those returning from the Gulf War, which was broadcast live via HBO on March 31, 1991. Similarly, during The Bodyguard World Tour (1993-94), "Where Do Broken Hearts Go" was used as the fourth part of a love song medley, added "Nobody Loves Like You Do" and "All the Man That I Need" to the previous tours'. In 1998, on Houston's 10-dates European Tour, she also delivered a performance of the song as the final part of a love song medley. ^ Hilburn, Robert (June 1, 1987). "Album Review : Houston: Commercial Sparkle, Artistic Fizz". Los Angeles Times. ^ "The Billboard Hot 100 Singles chart listing for the week of February 27, 1988". Nielsen Business Media, Inc. February 27, 1988. Retrieved February 4, 2011. ^ Jan DeKnock (April 22, 1988). "Whitney Houston Sets A Record". Chicago Tribune. Tribune Company. Retrieved February 4, 2011. ^ "The Billboard Hot 100 Singles chart listing for the week of April 23, 1988". Nielsen Business Media, Inc. April 23, 1988. Retrieved February 4, 2011. ^ Craig Halstead & Chris Cadman (2003). Jacksons Number Ones. hertford: AuthorsOnLine Ltd. p. 78. ISBN 0-7552-0098-5. ^ Lisa D. Campbell (1993). Michael Jackson: The King of Pop. Branden Publishing Company, Inc. p. 162. ISBN 0-8283-1957-X. ^ "The Billboard Hot 100 Singles chart listing for the week of April 30, 1988". Billboard. April 30, 1988. Retrieved February 4, 2011. ^ "The Billboard Hot R&B/Hip-Hop Songs chart listing for the week of March 5, 1988". Billboard. March 5, 1988. Retrieved February 4, 2011. ^ "The Billboard Hot R&B/Hip-Hop Songs chart listing for the week of May 7, 1988". Nielsen Business Media, Inc. May 7, 1988. Retrieved February 4, 2011. ^ "The Billboard Hot Adult Contemporary chart listing for the week of April 2, 1988". Nielsen Business Media, Inc. April 2, 1988. Retrieved February 4, 2011. ^ "The Billboard Hot Adult Contemporary chart listing for the week of April 16, 1988". Nielsen Business Media, Inc. April 16, 1988. Retrieved February 4, 2011. ^ a b "The Insider: Music Charts of 1988 (page 1)". Chicago Tribune. Tribune Company. December 30, 1988. Retrieved February 4, 2011. ^ "The Insider: Music Charts of 1988 (page 2)". Chicago Tribune. Tribune Company. December 30, 1988. Retrieved February 4, 2011. ^ "The RPM Top Singles chart listing for the week ending March 5, 1988". RPM. 47 (20). March 5, 1988. ISSN 0315-5994. Retrieved February 4, 2011. ^ a b "The RPM Top Singles chart listing for the week ending May 14, 1988". RPM. 48 (4). May 14, 1988. ISSN 0315-5994. Retrieved February 4, 2011. ^ "Top 40 Official UK Singles Archive: the week ending date March 12, 1988". The Official Charts Company. March 12, 1988. Retrieved February 4, 2011. ^ "Top 40 Official UK Singles Archive: the week ending date April 2, 1988". The Official Charts Company. April 2, 1988. Retrieved February 4, 2011. ^ a b "The Irish Singles Chart searchable database". Irish Recorded Music Association. Retrieved February 4, 2011. ^ a b Kent, David (1993). Australian Chart Book 1970–1992. St Ives, NSW: Australian Chart Book. ISBN 0-646-11917-6. Note: Used for Australian Singles and Albums charting until ARIA created their own charts in mid-1988. ^ a b "Tutti i successi del 1988". hitparadeitalia.it. Retrieved February 4, 2011. ^ ""Where Do Broken Hearts Go" performances on the Dutch Singles Chart". dutchcharts.nl. April 23, 1988. Retrieved February 4, 2011. ^ ""Where Do Broken Hearts Go" performances on the New Zealand RIANZ Singles Chart". charts.org.nz. June 12, 1988. Retrieved February 4, 2011. ^ Bill Kelley (August 21, 1987). "'Montreux Festival' A Rerun Alternative". South Florida Sun-Sentinel. Tribune Company. Retrieved May 23, 2011. ^ "Whitney Houston's Historic AMA Wins and Performances". realrnbradio.com. November 21, 2010. Retrieved May 23, 2011. ^ Steve Morse (June 9, 1988). "Big Tribute To Mandela To Fill Wembley Arena". Chicago Tribune. Tribune Company. Retrieved May 23, 2011. ^ "Fox to Telecast 6-Hour 'Freedomfest' for Mandela". Los Angeles Times. Tribune Company. June 2, 1988. Retrieved May 23, 2011. ^ "Whitney Houston welcomes Home US Troops in Live HBO TV Special on Easter". Jet. Johnson Publishing Company. 79 (24): 37. April 1, 1991. Retrieved May 23, 2011. ^ "Ultratop.be – Whitney Houston – Where Do Broken Hearts Go" (in Dutch). Ultratop 50. Retrieved February 4, 2011. ^ "Item Display - RPM - Library and Archives Canada". Collectionscanada.gc.ca. 1988-05-07. Retrieved 2019-03-27. ^ "Íslenski Listinn Topp 10 (25. mars 1988)" (PDF) (in Icelandic). Dagblaðið Vísir. Retrieved July 26, 2018. ^ "Nederlandse Top 40 – Whitney Houston" (in Dutch). Dutch Top 40. Retrieved February 4, 2011. ^ "Charts.nz – Whitney Houston – Where Do Broken Hearts Go". Top 40 Singles. Retrieved February 4, 2011. ^ Salaverri, Fernando (September 2005). Sólo éxitos: año a año, 1959–2002 (1st ed.). Spain: Fundación Autor-SGAE. p. 693. ISBN 84-8048-639-2. ^ "Whitney Houston Chart History (Hot 100)". Billboard. Retrieved February 4, 2011. ^ "Whitney Houston Chart History (Hot R&B/Hip-Hop Songs)". Billboard. Retrieved February 4, 2011. ^ "Whitney Houston Chart History (Adult Contemporary)". Billboard. Retrieved February 4, 2011. ^ Carolyn Hope. "Barry's Hits of All Decades Pop rock n roll Music Chart Hits". hitsofalldecades.com. ^ "Billboard.BIZ". Billboard.BIZ. 1988-12-31. Retrieved 2012-01-08. ^ "American single certifications – Whitney Houston – Didn't We Almost". Recording Industry Association of America. Retrieved December 24, 2008. If necessary, click Advanced, then click Format, then select Single, then click SEARCH.